condensed the route down to a paragraph per stage – reading it this way appeared much more achievable. I headed off to the supermarket to buy supplies. Having never done a Challenge before I had no idea what I would need to maintain my energy or to keep me awake over a 24 hour period. I opted for simple food – mandarins and bananas. I had already bought some protein bars back in Wellington so I felt reasonably well equipped, but at the same time nervous that this would prove to not be enough to get me through. My biggest concern about the ride was the toll it was likely to take on my body. I tend to get sore shoulders from a combination of bad posture, and lack of upper body strength. I was hoping that the weights program I had set myself in the gym would help me out in this regard. My bad posture was assisted by a Revit lower back brace which I hoped would help me sit upright and stay relaxed in my arms. 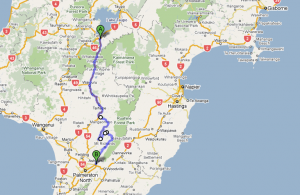 There had been little or no discomfort on the 360 km ride to Turangi from Wellington – could I last for the 1610km? I would soon find out. Tiredness was the biggest danger. Could I actually fall asleep riding a motorbike? Suggestions from my work colleagues ranged from taking illegal drugs (discounted) to cat-naps (seriously considered) to talking No-Doz (purchased and on hand in case of need). To top this off I knew I needed to travel an average of 67km/hour to complete in 24 hours exactly. That left little time to sleep, and every minute I spent resting meant the average speed needed to be increased to meet the deadline. Returning to my motel in Motuopapa I thought I’d lie awake all night worrying about my options. I slept soundly. I couldn’t believe it. No real anxiety at all, just a desire to get cracking and start the damn thing. I had organised a late late checkout from the motel on the Saturday. 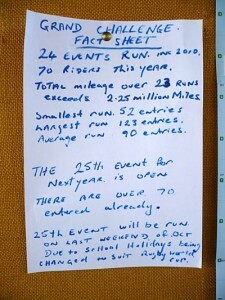 The Challenge briefing was at 2.30pm and my start time was 3.12pm. Arriving at the Turangi motor-camp around 1pm I had what seemed like an interminable wait for the start. To cap it off I knew no-one; the weather was stupendously hot; and frankly everyone looked far more experienced and far more organised than I was. I did a quick check – I was the only person there on a single cylinder (BMW F650GS) other than a chap on a Suzuki GN250 (I think he made it back within 24 hours). 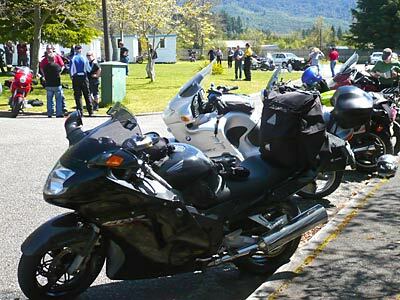 The majority were road bikes – evenly split between sports and tourers, with a few adventure bikes (BMW 1200GS, and Suzuki V-Strom). Then the odd ones – a couple of Yamaha RZ350 two-strokes, and some Honda Gold Wings and a Harley Davidson ElectraGlide. The briefing was brief, thankfully. Lee Rusty, convener of the Challenge stood on the steps of the dining hall with the other Rusty Nuts members and read the rules. I can’t remember what they were except to be careful and don’t be stupid and to take special care on the Napier to Gisborne leg given the massive storm that had swept through that region several days previously. I pulled on my gear, leaving enough warm gear to progressively add as the day wore on and the weather got colder. Then I waited for my start time. Each group of eight left in 2 minute intervals. Two minutes is a long time when you are waiting to do a 24 hour endurance race. I’m not a fast rider, or even a particularly good one if truth be told – perhaps always a little too cautious. I did the first hour at an average speed of 105 km/h. 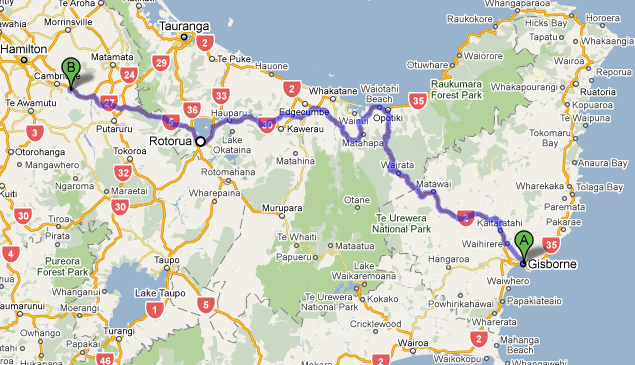 After that first hour I lost track suffice to say that the route through northern Manawatu was windy and very scenic. A pity I had no time to stop and admire the view. In that first leg to Ashhurst I rode sometimes alone and sometimes with others, usually those who left after me. The route was complicated and I made two U-turns to get back on the right track. There was a time check at Ashhurst – a 30 second stop where I didn’t even turn off the ignition to hand over my card and have it signed off by the official markers. Through to Woodville for the first fuel stop. The Caltex station was teeming with motorbikes. One chap on a Ducati Monster was covered in mud from what appeared to be a non-conventional detour down a bank. No damage and it appeared he was ready to carry on. 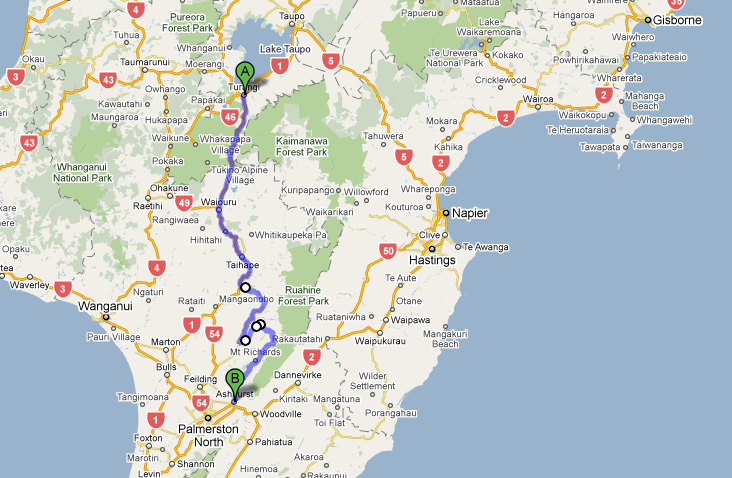 I waited in line, filled up, had a toilet stop and then headed off south along SH2 towards Mangatainoka. The idea was to turn left just past the Tui Brewery and head towards Pongaroa and SH 52, a winding badly sealed and bumpy rode that traversed southern Hawke’s Bay. Two thirds of the way to Pongaroa I came around a sharp bend to be confronted by a lone rider waving me down to stop. There was an accident up ahead with around seven or eight riders in attendance. I asked the chap who stopped me what the protocol was. The situation appeared quite serious. The fallen rider was, or had been unconscious and there was no sign of professional help. I was assured that help was on it’s way and that there were plenty of people looking after the chap, but even so, it felt strange and a little disconcerting to ride past. Five kilometres further on a fire-truck, a police car and an ambulance passed me heading back towards the scene to provide assistance. I later heard the rider had been airlifted to Palmerston North hospital. An accident three hours into the Challenge put the willies up me a little and so I carried on somewhat more cautiously towards my hometown, Waipukurau. The checkpoint was at the Mobil service station. There were around eight or nine bikes there when I arrived. I signed in and then headed straight around to my mums for a cup of coffee and a quick sandwich. Poor old mum (she’s 82) revealed that in an act of motherly love she had gone down to the Mobil station to wait for me, in the belief that I wouldn’t have time to pop around and say hi. She had waited for nearly two hours before giving up and heading home! As it was she was nearly right. I stayed for only enough time to quickly eat and drink, and add some extra wind-proof socks and an extra jersey. My GPS tracking device said I left Waipukurau at 9.13 pm. Already six hours in and only through two checkpoints! The road through to Napier I know like the back of my hand so had no problems taking the heavy traffic detours and negotiating the new expressway that often trips other travellers up. My fuel was getting low, and I hoping that my memory served me correctly and that there was a service station at Bayview a few kilometres before the Napier/Taupo turnoff. Thankfully I was right. I had never been happier to see the green and yellow flower of a BP station. I ignored my private boycott of British Petroleum and filled up. There were three other bikes there. Two chaps riding sportsbikes, and another guy who turned out to be Robin Rusty (although I didn’t know him at the time). We chatted a little but my ears were buzzing so much I couldn’t hear much of what was being said. There was some talk of another accident, but I couldn’t be sure through my tinnitus whether they were speaking of the SH52 crash or another one. Maybe 20 or 30 kms on the three from the Bayview petrol station overtook me and I found myself riding completely alone. There was very little traffic at 11.00pm. The storm that had passed through days previous had caused havoc. There were slips down on the roadside what seemed like every few hundred metres, and where there was a slip water generally poured across the road. Even so, it was relatively easy going. The night was absolutely clear and there was virtually no wind to speak of – perfect riding conditions apart from the state of the road. 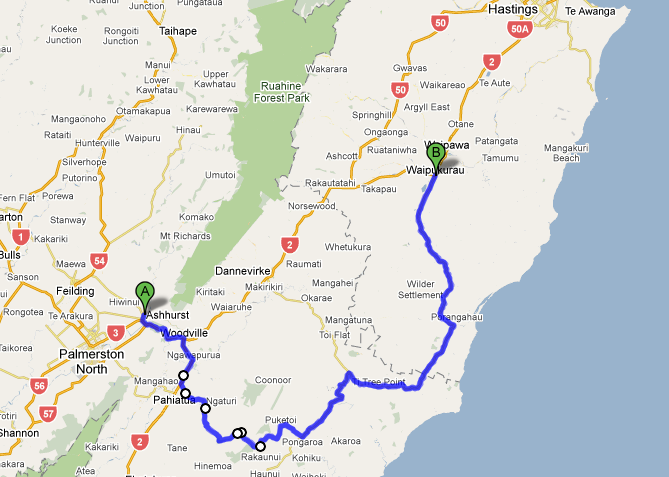 I made it to Wairoa at around 11.43pm. The next piece of road was uncharted territory for me. Instead of taking SH2 to Gisborne (the normal way) the Challenge directed us along SH38 towards Waikaremoana and Tuhoe country. 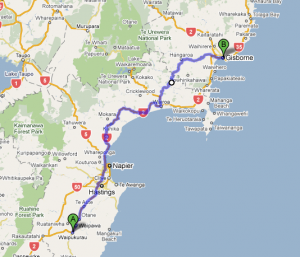 Before long the idea was to turn right and take the Tiniroto road – the inland and alternative route to Gisborne. Let me tell you, this is as remote as you could possibly get. A narrow and very windy road; completely alone; no traffic coming towards me; no traffic overtaking me (perhaps I was last? ); still bad slips on the road; no roadside markers so every corner needed to be treated as a potential hairpin; wildlife, mainly possum, but also the odd ferret and rat, wandering around waiting to be hit; and very little in the way of farmhouses or help in the event of an ‘off’. There was a moment, or two where I honestly questioned whether I was on the right road or not. Thankfully I have a good sense of direction and so my gut feeling was that I was heading in the direction of Gisborne. And because the night was so clear, and there was a half-moon, I subconsciously found myself navigating by the stars. Finally I came to a sign saying “Gentle Annie” and a warning about a steep grade. And there in the distance were the lights of Gisborne. I had almost arrived – at least I was close enough to feel confident and relieved. Only a few people at the Caltex petrol station on Gladstone Road: the Rusty Nuts marshall who signed my card; a wiry security guard; and a very large and imposing service station attendant. It’s now 1.26am. I fill up with petrol and have something to eat. Two young kids amble by. The boy asks me where I’m going. I tell him about the Challenge and he looks at me in awe – I hope. Either way I feel great to have made it this far. I’m not tired, and I’m not sore. 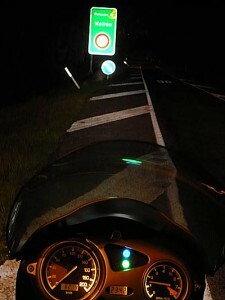 I hop back on the bike and head back the way I have entered Gisborne. There are a surprising number of people around including a few drunk youth staggering along the highway, thankfully walking and not driving. 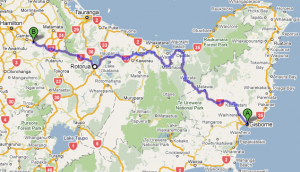 I’m looking for the road through to Opotiki – the continuation of SH2 which cuts through the bottom of the East Cape and which will let me enter into the Bay of Plenty. I need to travel through the Waioeka Gorge, yet another windy road not to be taken lightly at 2.00am in the middle of the morning. The weather has held up. There’s still no wind and no cloud so visibility is good. I enter the gorge proper, round a corner and see a figure standing on the side of the road flashing a torch at me. It’s another downed rider. His bike is lying on it’s side just off the road. I stop and ask if I can help him pick it up but there’s no point – the side stand is broken and there is oil pouring out of the crankcase. He tells me he was avoiding a rock fall which literally happened as he rounded the corner. I then realise I have just ridden through the debris on the road miraculously without hitting any of it. I checked he was OK – he assured me he was – and then suggested I get him some help. 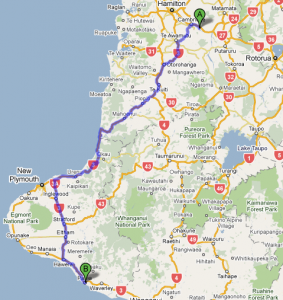 Others had beaten me to it, riding the remaining 40-odd kilometres to Opotiki to arrange the salvage. And so I left this chap, on the side of the road, with nothing for company other than a torch and a broken bike, and headed on my way. I reached Opotiki at 3.21am. For some strange reason I had real trouble finding my way out of this small town. I passed the petrol station where the same three riders I had met at Bayview were refueling. I waved to them as I sailed past confident I was heading in the right direction, but I soon discovered I had missed the main highway sign that would have led me on my correct path. So I stopped on the side of the road to consult the map on my phone. Next moment a car pulled up alongside and a couple of guys enquired what I was up to. Turned out they were the local crime-fighting guardians – they helpfully pointed me in the right direction telling me to cross the bridge and follow my nose. I did as I was told and sure enough, after some time of ignoring the signs to Whakatane I did indeed find SH30 which would lead me past Lake Rotoiti and around the southern end of Lake Rotorua. About 30 kms out of Opotiki a bike overtook me at great speed. Then soon after another bike began following me. It turned out to be Robin Rusty on his BMW 1150. Together we stopped in Rotorua for petrol and introduced ourselves. It was getting colder so I struggled into my rain gear which I hoped would help keep the wind as well as the rain out – not that it was raining – yet. Robin asked if I had seen the traffic cop flash his lights at me on the approach to Rotorua. I said I hadn’t, at all. He laughed and told me when I hadn’t slowed down the cop flashed his blue lights at me as well. Perhaps I was more tired than I thought. Robin became my riding buddy from Rotorua for the rest of the ride. We made it to Karapiro Mobil at 6.22am as the cafe attached to the station was getting ready for the Sunday breakfast crowd. My card was signed while I ordered a flat white and made a toilet stop. I was still surprisingly awake. It was almost fully light but because I had been riding all night it felt like late afternoon rather than very early morning. While I drank my coffee the two-stroke brigade pulled up. Two Yamaha RZ350’s ridden by two Rusty Nut Grand Challenge stalwarts. The more senior of the two was on his 20th Grand Challenge, every one of them completed on a similar machine. That’s no mean feat given the lack of comfort on a high revving two stroke and the need to refuel every 150 miles or so. Robin and I headed off towards Cambridge where we would turn left and head towards SH3, heading back down other side of the giant North Island circumnavigation we had started 15 hours earlier. The day got progressively lighter until it reached a static kind of grey and then just kind of hung. It looked like it was going to rain. Te Kuiti was a refuel for Robin. 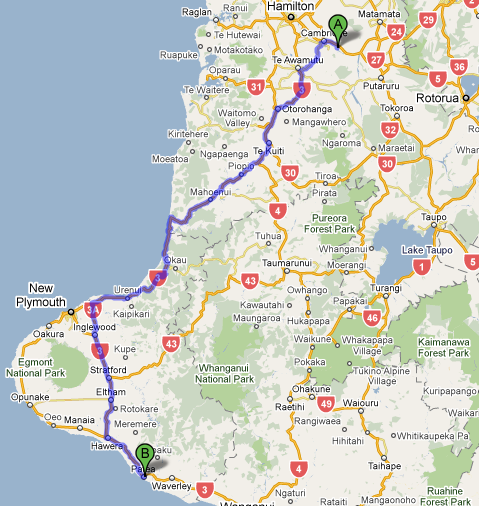 We left there at 7.26am heading south-west through Piopio, Paemako, Mahoenui, and towards the coast to Mokau. My fuel light came on just after I had passed a petrol station in Urenui. I tried to remember when the last time it was that I had filled up and realised it was way back in Rotorua. I’ve never run my bike dry but reckoned I had at least another 50 or 60 kms in the tank. Waitara would be the next big town, but little did I know that it’s slightly off the highway and I didn’t want to make the detour. Pressing on we came to the Inglewood / Stratford turnoff. I wondered if I would make it to Hawera believing that that could be the next significant town to have a petrol station open. Inglewood was first up and I was pleased to see it was a bigger town than I remembered. A Shell logo down a side street caught my eye and indicating to Robin that I needed to fill up I made a bee-line for it. We had our cards checked by the marshall. There was a small group of riders having a rest, and a bit of a queue for the toilet. It was 10.25am and I have to confess that after nearly 19 hours sitting on a motorbike my backside was aching something wicked. Every small town I came to where the speed reduced to 50kph I would stand up on my footpegs and stretch my legs. It got so that even doing that was quite excruciating, and lowering myself back down into the saddle somewhat worse. No time to waste. The end was clearly in sight. 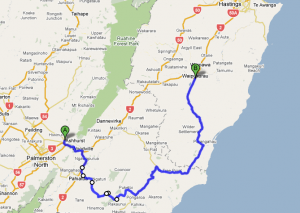 We headed south to Wanganui where the route led us right through the main street of Wanganui. Robin has a lot of Rusty Nuts patches on his jacket from previous Grand Challenges. I remember wondering if technically he was breaking Wanganui’s by-laws of “no gang patches in the centre of town”. We passed through without incident, across the river bridge and turned left onto SH4. The Paraparas were the last hurdle of technically difficult road and this far into the ride they did drag on a bit. We were overtaken by a group of around 4 riders, most of whom we caught at Raetihi when Robin needed to stop for fuel. I rested and shook my backside ready for the final push.It was 12.30pm when we left. No sooner had we left Raetihi than the rain started and I’m not talking a light drizzle. I’m talking a torrential horizontal downpour. Coupled with a blasting westerly wind the riding was treacherous. The 5 or 6 kilometres before the National Park turnoff saw wind buffeting us so badly that Robin, using the extra power on his 1150cc Beemer, overtook me and raced to the relative protection of the balcony at National Park Four Square. The wind was behind us as we travelled past the Chateau. The end was in site. I arrived at the Turangi campground at around 1.30pm. My odometer showed I had travelled 1680 kms in 22 hours 20 minutes. I was pretty chuffed. I went and found one of the Rustys to come and check my speedo and give me the official acknowledgement of completing 1000 miles in 24 hours. Lee Rusty handed over my badge and a congratulatory word or two, and suggested I might want to take advantage of a hot meal in the kitchen. To tell you the truth I was suddenly so tired that I couldn’t find the energy to get out of my gear and sit down. I thought if I did that I’d never get up. I went outside in search of Robin to thank him for being my riding buddy, and to half apologise to him for perhaps slowing him down. His comment was “Don’t worry – I’m tail-end Charlie!”. Did that mean that I was near the back of the bunch? Undoubtedly. Did it matter? Not on your life. Will I be back to do this next year? You bet! Thanks to Lee and the Rusty Nuts Motorcycle Club for a fantastic adventure! 72 riders set out on the day. 62 riders finished on the day. 2 riders pulled out after attending the crash scene on SH52 near Pongaroa. Another rider had an off resulting in a badly broken ankle. 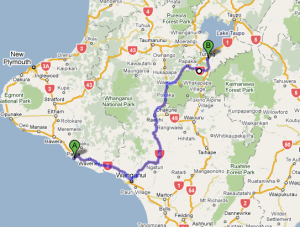 Another accident on the road from Gisborne to Opotiki resulted in a withdrawal. 2 pulled out with electrical problems and one with fuel problems. 2 pulled out tired. This would explain the large numbers of bikes passing through Hawke’s Bay a couple of weeks back.